What to do this spring! This week's blog post is from our friends at Garden Tribe, an online class designed to get you growing a great veggie garden fast, with 21 lessons, how-to videos, and access to a private Facebook community! At Garden Tribe we believe that growing your own food is a great way to help your kids develop their science skills, and their palates. Here are four ways to involve your kids in the garden this spring! Project: Designate an heirloom plant that your family will start growing every year. Teaching point: Heirlooms are plants that have been grown by several generations of people. They are planted again and again because they have particularly desirable traits, such as exceptional color or flavor. When you gather seeds from an heirloom plant, they will reliably reproduce the same plant. This makes heirlooms easy to save and grow again next year. Project: Grow more than three colors of the same plant, then have a taste-off! Teaching point: Varieties of the same plant can differ in color, flavor, shape, size, time to harvest and length of harvest. Smart gardeners plan ahead to get bright, flavorful and long harvests. Project: Grow radishes. It’s a classic kids project for a reason: it’s delightfully easy. Teaching point: Different crops take different amounts of time to mature. Radishes are one of the fastest growing foods, and can go from seed to mature in as little as a month. Mark the days off on a calendar to see just how quickly you can grow food. Bonus points: let a few radishes flower and produce seeds, and repeat the cycle. 4. Connect to the bigger picture. Project: Plant flowers and natives to welcome wildlife. Teaching point: Healthy food comes from healthy gardens, and healthy gardens are diverse ecosystems. The garden is connected to the greater world by the bees, bugs, butterflies and birds that come to visit. Take the time to notice what pollinators are in your yard, and share a picture or story through the Million Pollinator Garden Challenge. What are you teaching your kids about this spring? Let us know by adding a comment below. The person with the most original teaching point wins a free pass to Garden Tribe’s Boot Camp! It’s an online class designed to get you growing a great veggie garden fast, with 21 lessons, how-to videos, and access to a private Facebook community. Planting the Spring School Garden! We always plant the spring garden at my daughter’s elementary school the week before Spring Break. With our mild Texas winter this year, we could have installed it sooner, but as any of you who have worked with a school garden know, scheduling a planting day at school is about more than the average last frost date. In addition to students’ energy levels running high anticipating the upcoming vacation, teachers are also finishing up teaching units and are just as ready for a break in the routine. Most importantly, it represents a deadline. If we do not get the garden in before Spring Break, we have to compete with the dreaded Standardized Testing Zone that kicks off right after the break. Unfortunately, Mother Nature did not get the memo this year. Following two dry months, our planting week featured a spectacular 4.7 inches of rain. Offering a great teachable moment about the uncontrollable challenges that farmers face, the rain delayed our planting by a couple of days, but we still snuck it in before Friday’s final bell. Thank goodness for well draining soil! We garden in raised beds because our school’s native soil is only one step above concrete and this year offered a prime example of why it was so important to invest in high quality soil. Our beds contain an excellent vegetable garden mix with a blend of sand and compost, so even though the ground around our beds was drenched, the soil inside the beds was moist, but not compact. A top tip for all school gardeners--- don’t skimp when it comes to choosing your soil! We usually plant around a classroom theme for spring gardens, but this year we decided to return to our fall planting schedule which divides the beds up into small plots allowing students to partner up and take full responsibility for their plant selection. Each plot is approximately 15” X 18” in size and they are able to choose from a select list of vegetables and herbs that grow well in our area. Click here to download a copy of the worksheet we hand out to each student to help in their planting. Last fall, students really struggled with figuring out how to design their gardens and were even more challenged trying to visualize the difference in scale when they moved their plans on paper into their garden beds. But this second time around, the kids really got it. Most did a better job planning their gardens with the proper spacing in mind and when planting, they were able to translate their plans to the garden space better. Granted, the beds are still over planted, but I am hoping that they have learned their lesson about the dangers of overcrowding and won’t fight thinning the seeds quite as much in a few weeks (no one wanted to thin any seedlings in the fall) … guess we will see. I think what most impressed me was the fact that they were even more excited about planting this spring than they were in the fall (and trust me they were plenty excited in the fall too). Last fall, planting the little seeds was a bit abstract for many. This spring, I could tell they did not see seeds when they were planting, but instead were envisioning the full-grown plants that would be the end result. They were also more focused on their harvest and are eager to have the chance to share the fruits of their labor with their family and friends again. I have been helping with watering over the break (yep, those beds dried out quickly) and within two days, little radish seeds started to sprout. I can’t wait to see the kids’ faces when they get back from Spring Break and see their gardens growing! So much fun! Seed starting is a great way to initiate sensory play! My son John, is naturally drawn to the green world. He loves digging in my house plants and I often find him playing with last year’s seed packets. He likes to shake, rattle and pour them out! With spring fever upon us in Vermont, I brought out our seed starting supplies for a fun, family activity. 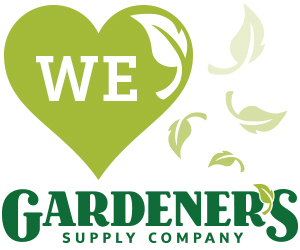 Although our planting may not result in your typical garden-ready transplants, we played, explored and ramped up John’s excitement for gardening. Here are a few observations about what he learned through this activity. New Words: Most seed packets have beautiful images or photographs on the packaging. This is a great way, especially with vegetables, to learn new words! Johnny knows his peas and beans, and is now really excited about sunflowers and tomatoes! I plan to use his interest to help me decide what I would like to plant in my garden. Last year, even at 12 months old, he loved to pick the strawberries and tomatoes to eat as an afternoon snack. Fun Sounds: Without any direction, the first thing that John did was shake the packets. He liked the kale seed packets the best! They were loudest and almost sounded like rain! Peeking & Pouring Out: I opened a few packets for him and I was surprised how gentle he was with them. We dumped the seeds out both in a bowl and in a seed tray. He loved the feeling as he grabbed handfuls of the different seeds. Unplanned Discoveries: John decided to pour kale seeds on the tray instead of in the bowl. He pushed the seeds up and down the grooves and then he rocked the tray back and forth to watch them roll up and down. Potting soil offers a new texture that is different from the typical sensory tables of sand and playdough, and a lot messier! After a few handfuls, he preferred to use the hand rake and enjoyed scooping and flinging the soil. I had to remind myself that making a mess was okay! In addition to experiencing the feel of the soil, I knew he was also able to smell the earthiness of the compost--- a smell I hope he will come to love as much as I do. We dumped our bowl of seeds on top of the soil and used the rake to spread them around. Next I showed him how to water the soil. This allowed him to watch, learn, imitate, and follow directions. He started off sprinkling water gently but then he decided dumping the water out of the top was faster. After watering, I encouraged him to feel the new consistency of the soil. He noticed that it was harder to brush the wet soil off his hands and clothes. It only took a few minutes! Johnny and I tried to pick up as much compost as we could and I dumped the remaining compost on the heap outside. We vacuumed and then we were done! We put the soil and seeds in the window, right next to all of mommy’s other plants so that we can come back and check on them each day. Through this activity, he will begin to learn about patience, a valuable life lesson. I look forward to watching him watch his new plants grow. He was excited and very proud! This week's blog post is from our friends at Fix.com, a lifestyle blog devoted to bringing you expert content to make your life easier! Have you noticed a dearth of pollinators in your garden of late? Honeybee numbers are declining due to several factors, and it’s finally starting to make headlines. The loss of bee colonies has far-reaching consequences that go well beyond missing the honey on your morning granola. About one third of our crops are pollinated by bees.1 Without these busy little bugs, fresh fruit and vegetables will become far more expensive, and less available. In our last article on the subject of Colony Collapse Disorder (CCD), we discussed how flower choice can make a huge difference to the number of pollinators visiting your garden. Another practical way to help restore bee colonies in your area is to create a bee-friendly garden. 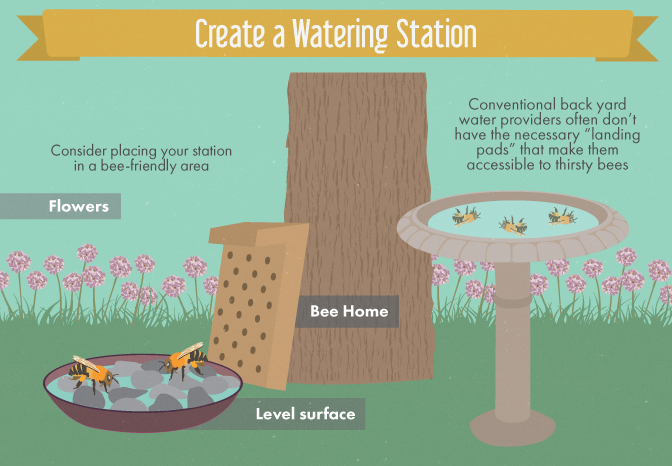 By providing shelter, food, and water, you can help the bees in your neighborhood to thrive. 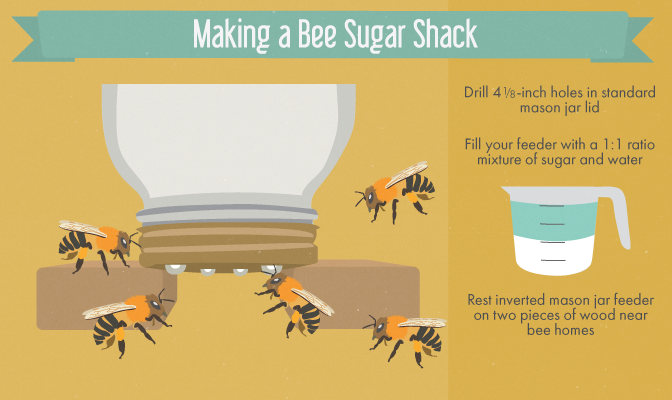 You don’t have to keep a hive to have a healthy bee population around your home. Not all bees live in large colonies – in fact, many species of bumblebees and honeybees live solitary lives.2 You can make these loners feel at home in your garden by creating a little BB&B (bee bed and breakfast)! This will also prevent these pollinators from boring into your carpentry or nesting too close to where you live and play. When selecting a location for your bee haven, be sure to pick a place away from human activity where bees could cause injury. Place all bee homes where they won’t be disturbed by pets or children. Bee board: Take an old piece of lumber and drill holes up to half an inch wide into the board.3 Ensure that the lumber has not been treated with chemicals. Now find a sunny spot in the garden like a tree or a fence post where it’s dry and cool in the winter. Make sure that your bee board is sheltered from the rain. If you don’t have a suitable place, use another old piece of lumber to create a little roof to keep your bees dry. You can further protect the bee larvae by bringing the bee homes into your garage or shed in the winter to prevent them from getting wet. Be sure to store them in a cool, dry place. If you have woodpeckers, protect the bee board with chicken wire so that they can’t peck out the bee larvae. Stick homes: While bee boards work fine, bees are far more partial to nesting in little tubes. You can use hollowed sticks that have been thoroughly dried and are free of chemicals. Bundle the sticks together and hang in a dry, sunny spot in the garden. If you have an old shelf, you can stack the bundles so they are protected from the rain, or you can fashion a roof from a piece of old lumber to keep your bees dry. 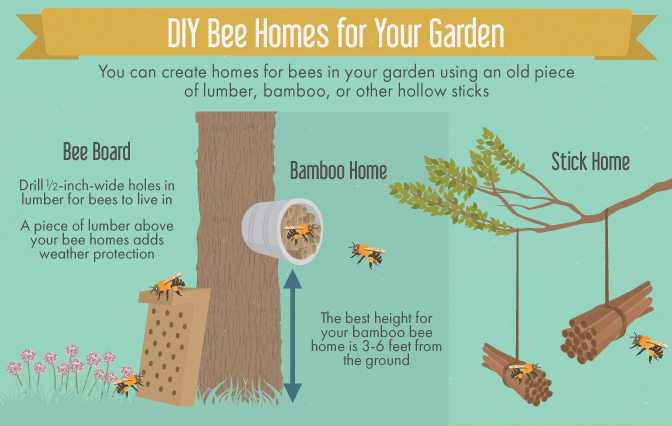 Place the bamboo bee’s nest three to six feet off the ground in a warm, sunny spot that is protected from the rain.5 Tree branches or rafters work best, but if you can’t find a dry spot in your garden, take an old tin can and drill a hole in the bottom. Now use a screw to secure the can to a wooden fence post, to a shed or tree or the side of your home. Place the bamboo pieces in the tin can and you have the perfect bee home. Make sure your bee buffet is always stocked by planting different crops that flower throughout the spring and summer. 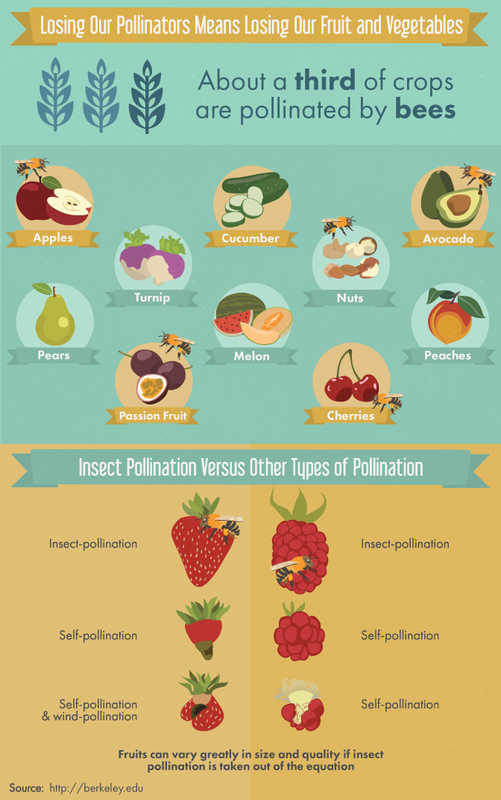 Flowering fruit trees and vegetables are also bee favorites: fruit and berry flowers provide pollen in the early season, while squash and pumpkins are good choices for later in the summer. See our complete guide to gardening and planting for bees for more information on perfect flower selection and other practical tips. Bees also need an accessible source of water. The best option here is to fill a shallow bowl or drip tray in the morning with an amount that will evaporate by early evening. Place a few rocks in the tray so the bees have a safe place to land. This is important, because often backyard sources of water contain no landing pads, and as a result bees crash land and drown, or pass up the water source entirely. Replace water daily and leave the tray at ground level near your bee homes and flowers. As research on what’s happening to our bees continues to emerge, it’s easy to feel powerless about fixing the problem. But by observing sound planting policies and a few easy green DIY tips, you can make your garden an oasis for our pollinators, who currently need all the help they can get from us!